Customer Feedback and Reviews - Please send us yours! Let me tell you how happy I am writing to you tonight. I received my order today and the long coat is amazingly beautiful. WOOOW !!! I was looking for exactly this model for over 20 years and have only found it in your website this summer. I am more than happy. This dream has come true, thanks to you.Thank you so much I also want to say how much I'm happy with the quality and cut of this duster coat. And the size is perfect. Finally... To all potential customers that would like to order one with you... I just want to say : "Order there, believe me, they (19th century tailor) are great !!" Thank you again...And I will send you a picture as soon as possible !! wanted. Thanks very much for a job well done! Hi Nancy thanks for getting back to me , ok so in May I won (again) 2nd year running, the Yeovil Town criers championship and of course won the Best dressed crier, then last week I won the Belgium international championship in Ooidonk, Near Ghent. On the 17th October I host the British National championship in Hastings, the oldest comp in the World of Town Crying , this is the 63rd year. I cannot enter, ever, as it is always held in Hastings, but I shall run the day and I'm sure it will as always be a good day. Hope you like the photo and if your passing on the 17th or any other time, come and say hello ! I apologise for the delay in contacting you, but we have been really busy the last month or so with doing events. You recently made a 95th Rifles officers tunic for me. This is the first time I have had anything made for me, May I say that the item was very well made and I am very pleased with the finish. I have seen some items made, not by yourself, and they leave something to be desired. I would have no hesitation in recommending you to anyone who wants items made. We have had the photos back. They are brilliant. So many people commented on Ian's jacket. He looked awesome. It suited him so well! I will try to attach some photos for you. I hope they get to you ok. I am still writing thank you letters. I will send yours to you asap. I couldn't decide which ones would be best to show the jacket off, so I thought I would let you pick the best one for your portfolio. Here are some lovely photos of your uniforms in action. It's a comedy (Donizetti's "Daughter of the Regiment), so you will have to excuse our lack of period correctness and formality. Funny trumped all, on this show! However, I got lovely compliments thru out the process on how great those men looked in your work. So, thank you very much! Frock coat arrived on time, was the correct size, was worn on the occasion on which I had hoped to wear it and was admired by many. The promised extra buttons arrived a little later. Thank you very much for everything. It would have been nice if I could have sent you a photo but unfortunately, due to poor light and the overwhelming amount of black being worn by the people around, I don't have anything which shows it to advantage. I assume your Battle of Waterloo was, like Wellington's, a 'close-run thing', or dare I say, a 'clothes-run thing'...... however, you obviously survived without too much injury; and thus were able to produce my vests. And amazing waistcoats they indeed are! They are certainly eye-catching pieces, and beautifully made. Moreover, the fit is perfect. Thus many thanks indeed, and I hope the job did not cause too much trouble. Thankyou so much for these - Chris is pleased-as-Punch with them . . . well-worth waiting for! Picture of the waistcoats for you, thanks for making them they were just the ticket. Just a couple of photos to show the shirts in use - unfortunately you can't see the shirts in the full uniform photos but apparently the high neck stopped the leather stock from rubbing. The waistcoats were a great success at my daughter's wedding, much admired and commented on, will send pictures asap. It looks absolutely fantastic (Napoleonic Coattee with silver epaulettes). Thank you so much for all your hard work on this. I am writing to acknowledge receipt of the Waistcoat I ordered, which arrived today. It is absolutely perfect, and I cannot thank you enough. I shall definitely be ordering from you again in the very near future. Thank you kindly. We received the duster coat this afternoon and it fits very well. Plus, it looks great and we love it as much as he does. Great fit on my son and it and looks right marvellous. It should keep him dry and will give good protection from the weather if looked after because we can easily replenish it with oilskin wax-cotton spray clothing care products. Hello. How are things going? My son is looking forward to the duster coat we ordered on December 23rd 2014. He's been counting down the weeks so far and waiting patiently for the day it arrives.Thank you. Just a short note to let you know that I received your waistcoat this morning. It is absolutely fabulous, and the velvet-effect covering to the buttons is the icing on the cake.I think I would like to order a frock coat from you, but to be on the safe side, I will get in touch in about a month to see whether it would be OK for me come in for a fitting. Once again, thank you for your skill and attention to detail. if I were there for a fitting......you guys...are GREAT. I confirm good reception of the coat. I just wanted to say that the work delivered is fantastic and goes far beyond my expectations. I feel like I am wearing a piece of art. Yesterday I have received the waist coat. It is a wonderful hand craft work and just beautiful. Thank you very much. This is to just to let you know that the frock coat we ordered from you arrived yesterday and to thank you for an excellent tailoring job. The coat is beautifully made and fits perfectly and is a credit to your skills. Dear Nancy, I'd just like to say a huge thank you for turning around my order for the 18th Century frock coat in good time for my wedding. The jacket was perfect and I was proud to wear it. I'll definitely be ordering from you again, and often. I've enclosed a couple of photographs in case you're curious. The coat arrived yesterday and is absolutely perfect. The photo on your website does not do the finished article justice!It looks amazing with my full ensemble - the 'swish' is perfect - and I will be proud to wear it when I get married! Thank you so much for turning it around in the time available. We will certainly be buying from you again. It was just about one year ago when I received my first product from yourselves, the CT9001 18th Century Gentlemans Frock Coat, and I absolutely love it. I often wear this coat as my normal day wear when out and about and it does keep me nice and warm on the cold English days. I even wear it to work on dress-down Fridays. I would just like to say thank you for such a wonderful and well made coat. It is such a shame these styles fell out of regular fashion over the years (centuries). I looked for a coat just like this for a long time and I'm sure in the near future you shall be seeing my name on another order. But for now, I will wear your coat with nostalgic pride. Apologies that this thank you is rather late but nonetheless - Thank you very much. Thank you so much. The waistcoat arrived today, it fits perfectly, and looks superb. I have been the proud owner of one of your frock coat suits for almost 4 years now. I love the frock coat so much that I wear it as a part of my every day wear, as well as with any of my 3 piece suits- I just prefer the cut and style of a frock coat over any modern suit jacket- and your frock coat has been an absolute joy to own and wear. However, it saddened me today to notice that the right elbow is beginning to fray from wear, and I fear a hole is about to develop (the cloth weave is basically coming apart). That is, in fact, the suit I purchased from you (albeit with plain white lining). Matthew Palmer - CA, USA. Message:I have been most remiss on not thanking you for the splendid frock coat you provided me with earlier this year! Before it's arrival my everyday attire was completed with a morning coat and looked a tad too much like dressing for a wedding. Now I look far more the Victorian gentleman! I will be back for more (trousers, most of your waistcoats etc) as and when my balance can handle it, and will always recommend you to friends and strangers alike! Thank-you for the Uniforms they arrived Tuesday and they are excellent - will recommend to all my friends. Also show them off at this years "Asylum - Lincoln" Steampunk event. WOW, the jacket is amazing. February 2013 55 pieces of early 19th century uniform and menswear ordered by national museum for major new display. 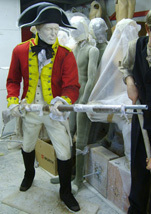 2012 has been an incredibly busy year with over 2,000 uniform and costume items already having been dispatched to customers in Film, TV, Theatre, Museums and Re-enactment. As a result, at times our delivery time has been longer than we usually quote, this has been entirely due to the pressure of work and as a result we have now expanded the workforce in order to cope with demand. We would like to apologise for the delays and thank you for your patience and understanding! I received the oil cloth duster today, and I wanted to let you know that I am extremely pleased with it. The fit is perfect, and you did a wonderful job. I must admit that I was very apprehensive about ordering this coat initially, as I was afraid that I might not be what I had anticipated when I received it. You certainly proved there was no need to worry. If you ever need to use me as a reference for customers here in the US, please feel free to do so. Also, the wooden buttons on the coat look fine, but if there any available, I would like to replace them with buttons made from dark colored horn. Do you have any idea of where I might aquire these? And lastly, did you happen to make the oil cloth duster that Sean Connery wore in the film The League of Extraordinary Gentleman? Although not exact, this coat you made for me look very similar to the one in the movie. Anyway, thank you again for such a wonderful job. I received my Kings German Legion Tunic and Tombstone Shirt yesterday. Thank you, I am so thrilled with the quality and detail of the clothing. I can see what painstaking work that has been done on each item.